TURIN – Life is about to get more challenging for Volkswagen Group designers. For their future creations to go from pen to production model they will have to be better than the man who is considered by many to be the best car designer of the 20th century. “I think that competing against a true living legend of automotive design such as Giorgetto Giugiaro is a fantastic challenge for any VW group designer,” VW Group Design Director Walter de' Silva said Tuesday following the announcement that VW had taken a 90 percent stake in Italdesign Giugiaro S.p.A., Italy's most powerful design and engineering firm. Giorgetto Giugiaro, 71, who was named car designer of the 20th century by an international jury in 1999, and his son, Fabrizio, 45, will retain 10 percent and continue to work at the 42-year-old company that is famous for designing cars such as the first-generation Volkswagen Golf. Italdesign, which is based outside of Turin, will become the fifth VW Group multibrand design center. There are three multibrand studios in Germany (Munich, Potsdam and Brunswick) and one in the United States (Santa Monica, California). These centers support – and compete against – each other as well as the individual design studios for Audi, Skoda, Seat, VW, Bentley, Lamborghini and the other four brands, including Porsche, that make up the VW Group. De' Silva is in charge of all of VW Group's design operations. “Italdesign will compete with all of our design centers because competition enhances creativity and VW never wants to be second best when it comes to design,” de' Silva said. He is counting on Italdesign to relieve some of the stress he and his team face as they try to manage a combined 140 projects, which include designs for new models, refreshed models and upgrades to vehicle interiors. As part of the takeover deal, VW has promised to give Italdesign the freedom to keep pushing the boundaries of design. “I want Italdesign Giugiaro to continue producing innovative vehicles concepts, such as the (Proton) Emas minicar unveiled in Geneva” in March, VW CEO Martin Winterkorn said. 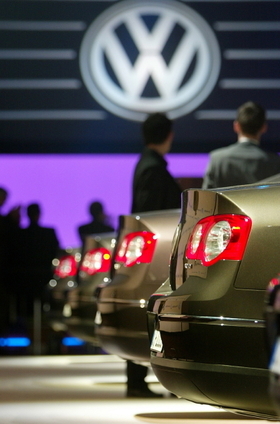 De' Silva said that those future concept vehicles only will be designed for VW Group's ten brands, including Porsche. He added that he wants people to continue to see Italdesign as a leader in the field rather than a VW subsidiary. 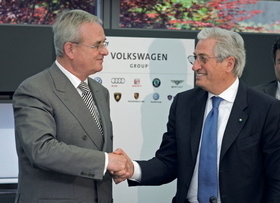 VW CEO Winterkorn (left) wants Giorgetto Giugiaro and his team to keep producing innovative concept cars.